This is a book about swimming, about how Alexandra Heminsley overcame her fear of water and learnt not only to swim, but to enjoy swimming outdoors in choppy seas, cold rivers and dark tarns. Heminsley’s earlier book, Running Like a Girl, is about running when you don’t think you’re a runner and Leap In is the swimming version. It’s her honesty, the detail and her beautiful writing which make this such an engaging book; I could completely envisage the sweaty attempts to squeeze her body into a wetsuit, the feelings of panic in deep water, the anxiety about her bare feet when she does her first river swim. 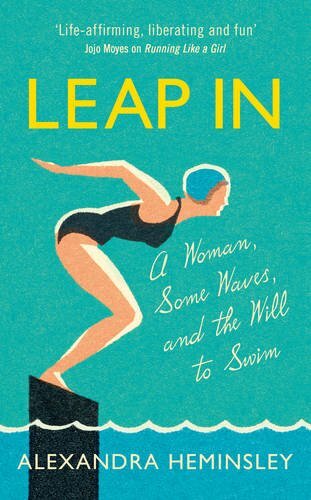 Leap In is about pushing yourself, about facing up to difficulties – and we learn more than half-way through the book that Heminsley is going through fertility problems and IVF as she continues her swimming journey. At that point, her battles to overcome her fears have an undercurrent of a more fundamental challenge. Heminsley doesn’t tell us much about her fertility problems or the experiences of tests and treatment, but what she does say is rich with meaning for anyone who has been there. “When I think about never having a child, a sort of breathlessness, almost a vertigo, comes over me,” she writes, explaining in just one sentence the overwhelming hollow bleakness of infertility. She has a positive pregnancy test after her second IVF cycle, but miscarries – something she deals with in two poignant paragraphs in which she describes the sense of crushing grief and how this transforms her relationship with her body which she feels has betrayed her and which she now rejects. I really love this book – it manages to be funny, sad, inspiring and thought-provoking. The last chapter of the first part ends with Heminsley pondering what lessons swimming has taught her and where her future lies. She says she doesn’t know if she will ever have a child, or even the strength to try IVF again, but her attitude to life is that we must Leap In, living life as a participant rather than a spectator, that we must not give into our fear of the unknown and must be courageous when we need to adapt or amend our plans and discover our inner strength and resilience. These are certainly thoughts to ponder for anyone who is in the midst of fertility problems. Leap In is published by Hutchinson. This entry was posted in fertility, infertility and tagged Alexandra Heminsley, infertility, IVF, Leap In, miscarriage, Running Like a Girl, swimming by fertilitymatters. Bookmark the permalink.